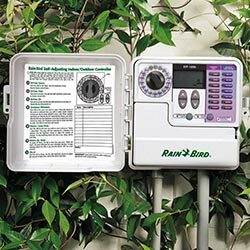 Take control of your sprinkler system with a ‘smart’ irrigation timer or computer irrigation controller system. Smart Timers use information about your plants, soil, and weather conditions to give your landscape the right amount of water year-round. They allow for more accurate, customized irrigation by automatically adjusting the schedule and amount of water in response to changing weather conditions. A Smart Timer can save you from over-watering your landscape by 13,500 gallons a year while still maintaining optimal plant health. Our rebate-eligible Smart Timers are tested by independent evaluators to ensure superior performance. Computer Irrigation Controller Systems are designed for larger irrigated areas such as golf courses, parks, schools and large commercial complexes. These systems consist of a master controller (often a computer) which tells the valves at remote locations to open and close. Most of these units can also monitor water flows to detect leaks, can tell if a valve is broken, and can adjust watering times based on the current weather. for properties less than one acre-or- $35 per station for properties greater than one acre.